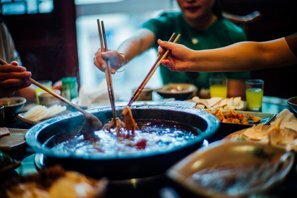 If you speak to a local about your stay in Chengdu, they&apos;ll probably ask if you&apos;ve sampled hotpot. Everyone who lives here seems to love it, and trying it should be a mandatory part of everyone&apos;s culinary tour of Sichuan. 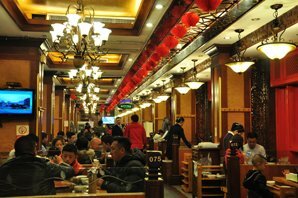 Hotpot restaurants can be found on pretty much every street in Chengdu, but the quality and taste can vary hugely. 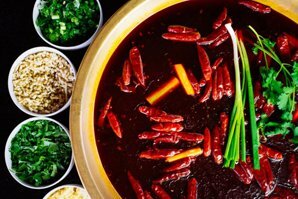 See &apos;recommended hotpot restaurants&apos; below for a list of some of the more renowned establishments in town. 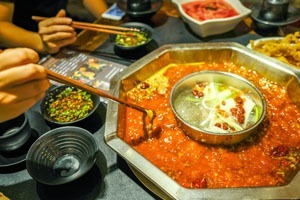 Sichuan food is renowned for being spicy, oily and packed with plenty of numbing Sichuan peppercorns, and the traditional hotpot is no exception. Even for those used to the local cuisine, hotpot can still be quite taxing on the digestive system. For those who have never before eaten food cooked in a bubbling vat of chilli oil simmering away at their table, having hotpot for the first time can be quite a shock to the system. 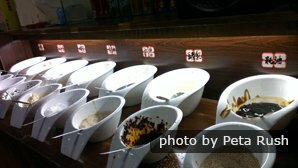 Locals advise eating a bowl of plain rice after your meal to soak up the oil, or having some yoghurt from a convenience store before your meal. 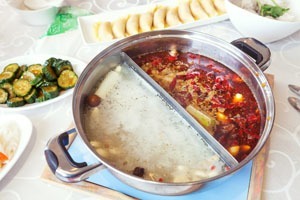 When you do go for hotpot, you will often be asked to select a choice of broth in which you cook your raw ingredients. If you&apos;re adventurous and up for a challenge, the traditional oily spicy broth might be just the thing you&apos;re after. But if you haven&apos;t yet fully adapted to the local palette, you might be better off choosing a non-spicy broth, or going for a less spicy option. Bear in mind that some broths like tomato, mushroom or northern style will not be on offer at every restaurant. It&apos;s readily available at most restaurants, these pots either come divided down the middle like a giant yin and yang, or with a separate smaller pot of clear broth in the middle. 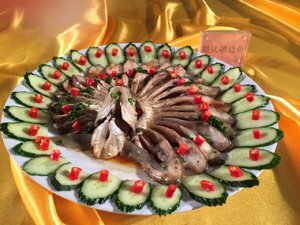 If you can&apos;t bear too much chilies and oil, but want to have a try, ask for yuanyangguo (鸳鸯锅). It&apos;s a spicy soup base with plenty of Sichuan peppers, chillies and red chilli oil. You sometimes have the option of specifying your spicy level: minimal spicy or weila (微辣), medium-spicy or zhongla (中辣), or maximum-spice or chaola (超辣). Tomato hotpot — this is like a big pot of spicy tomato soup, and is available at San Zhi Er (listed below). 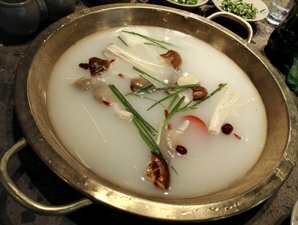 Mushroom hotpot — a non-spicy broth made from mushroom stock, and another good option for those trying to avoid spice (also available at San Zhi Er). Mongolian hotpot: another non-spicy broth, this time made using lamb stock. After you&apos;ve selected your pot, you&apos;ll also have to order the things you want to cook in it. Options vary between establishments, but most have a wide range of meat, vegetables, tofu and noodles on offer. 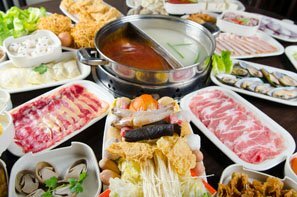 See our hotpot guide for a detailed list of some of the things you might find on the menu. In terms of how many things to order, three &apos;dishes&apos; per person is usually a good rule of thumb, so it pays to go with three or four friends to ensure you have a good selection of things to cook. When you order your hotpot, each person will also be asked to choose a dipping sauce. This is what you dip your cooked ingredients into in before eating. 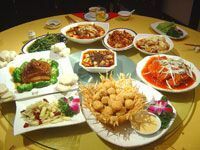 By far the most popular option is youdie (油碟), which consists of sesame oil and optional extras like oyster sauce, vinegar, garlic, spring onions and coriander, which you add according to taste. It somehow compliments the spicy and numbing taste of the hotpot, but if the thought of putting meat and vegetables cooked in chilli oil into more oil before eating turns your stomach, you might want to ask for gandie (干碟) instead. Gandie literally means &apos;dry plate&apos;, and it is just that: a plate with a selection of dry seasoning on it. This varies from place to place, but most include ground peanuts, Sichuan peppercorns, and chilli powder. The powders are usually separate on the plate, so you can stir in more or less chilli powder to taste, and add oyster sauce if you want to take the edge off the spice. Hotpot is a sociable affair. Everyone turns into a chef at the table, adding raw vegetables and meat to the central pot and extracting cooked things as and when they feel hungry. It can sometimes be easy to lose track of what was added when, but it&apos;s really important to ensure that meat in particular is properly cooked before eating it. Check with the waiter at the restaurant if you are unsure. Locals also advise taking food out from the middle of the pot, where the bubbles push the oil aside. This helps &apos;clean&apos; your food, ensuring you avoid consuming too much oil and spice over the course of the meal. Still Hungry? Order Some Rice or Bread. One common complaint from those eating hotpot for the first time is the &apos;empty&apos; feeling after hotpot, regardless of how much you&apos;ve just eaten. That&apos;s because in general rice isn&apos;t served with hotpot, and there aren&apos;t that many starchy foods to help your belly realise it&apos;s full. 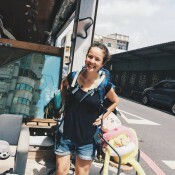 In Chengdu, locals tend to ask for rice at the end of the meal, but don&apos;t be afraid to ask for it up front, as this will also help absorb some of the oil from your food. You could also make sure you order some feibing (飞饼), a roti-like bread, to go with your meal. 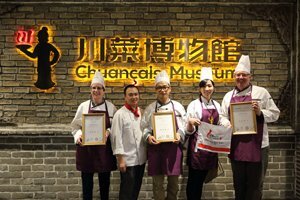 Enjoy hotpot with China Highlights. 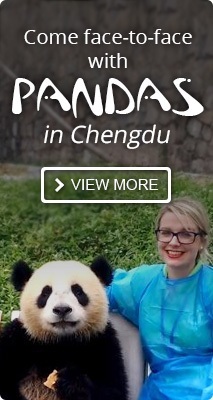 THE FLAVOR OF CHINA — Our 12-Day Beijing, Xi&apos;an, Chengdu, Guilin, and Hong Kong cuisine tour explores the most popular cities and savors an expanse of Chinese food. Not interested in the above tours? Just tell us your interests and requirements, and we are more than happy to create a tour for you based on your interests and requirements.